Geometry is an important subject not only in schools, colleges and universities but it has its own significance in many types of exams. The subject is as massive as the Pacific Ocean. If you are good at geometry, it can contribute to the advancements in job options too. But, studying it may be overwhelming for some of the students. In such a situation, taking geometry homework help can do wonders and can ultimately help you in scoring good marks. 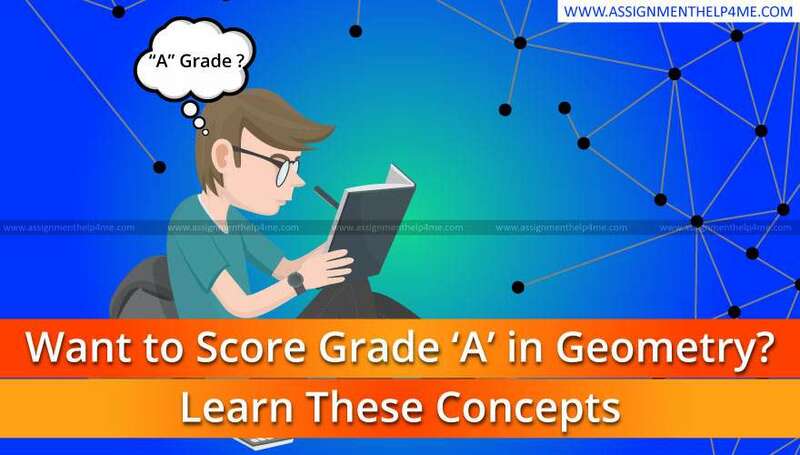 There are some concepts in geometry that can be managed with average practice and knowledge of some formulas but there are some concepts for which diligent preparation is required. Geometry is a subject which does not merely involve memorizing some facts just like history class. It needs more concentration and preparation. But, does it really help? There are some basic concepts which if learned and practice thoroughly can help to a great extent. This article is all about those concepts. Geometry was first founded on the basis of five postulates that were placed together by an ancient mathematician ‘Euclid’. If you are able to understand the five postulates, you will get the clarity of any of the concepts in geometry. • By joining any two points, a straight line segment can be drawn. • The continuation of any straight line segment can be done in a direction which is indefinitely in a straight line. • Around any line segment, a circle can be drawn. The one end of the line segment should be served as a center point and the length of the line segment should be served as the radius of the circle. • All the right angles are equal (congruent). • If a single line and a single point are given, only a single line can be drawn that too directly through the point which is parallel to the first line. When you are new to this subject, the number of symbols may overwhelm you. If you are able to learn each symbol and can recognize each of them, then things can become easier for you. • The properties of a triangle are symbolized by a small triangle. • The properties of an angle are symbolized by a small angle shape. • Properties of a line segment are symbolized by letters with a line over them. • Properties of a line are symbolized by letters with a line over them and with arrows at every end. • To symbolize two lines that are perpendicular to each other, one horizontal line with a vertical line in the middle is used. • If two vertical lines are drawn, it means that two lines are parallel to each other. • To symbolize two similar shapes, a wobbly line is used. • The word, therefore, is symbolized by three dots. • To symbolize two congruent shapes, an equal sign with a wobbly line on top is used. A line can be extended infinitely on both the sides. To depict this, arrows are drawn at their ends. Every line segment has an end and a starting point. There is another form of the line which is known as a ray. It can be extended infinitely only in a single direction. The types of lines are parallel, perpendicular or intersecting. • Two lines never intersect each other if they are parallel. • Two lines are perpendicular if they form an angle of 90°. • If two lines are crossing each other, that is known as intersecting lines. These lines can never be parallel and are perpendicular to each other. The three different types of angles are a right angle, acute angle, and obtuse angle. A right angle is one, the measure of which is exactly 90°. An acute angle is the one the measure of which is less than 90°. An obtuse angle is the one the measure of which is greater than 90°. According to Pythagorean Theorem, a² + b² = c². With the help of this formula, you can compute the length of the side of a right triangle, if the lengths of the other two sides are known to you. A right triangle is that triangle which has one 90° angle. In this theorem, a and b are opposite and straight sides of a triangle, where c is the hypotenuse of the triangle. Scalene, isosceles, and equilateral are three different types of triangles. A scalene triangle is one which has no equal sides and no congruent angles. An isosceles triangle is a triangle which has two congruent angles and two congruent sides. An equilateral triangle is one which has three equal sides and three equal angles. If you are aware of these types of triangles, you can easily identify the properties and postulates related to them. • Technically, an equilateral triangle is also referred to an isosceles triangle because it has two congruent sides. Hence, you can say that all equilateral triangles are isosceles but not all isosceles triangles are equilateral. • Triangles can also be categorized according to the angles- right angle, obtuse angle, acute angle. Right triangles have one angle of 90°. Obtuse triangles have one angle which is more than 90°. Acute triangles have angles which are less than 90°. Shapes which have the same corresponding angles and sides and which are proportionally smaller or longer than each other refers to similar shapes. On the other hand, congruent shapes are identical, they are of the same size and shape. Complementary angles are those angles which make 90 degrees when added up whereas supplementary angles are those angles which make 180 degrees when added up. Do not forget that vertical angles, alternate interior, and alternate exterior angles are congruent. • The two angles that are formed with the help of two intersecting lines and are opposite to each other refers to vertical angles. • When two lines intersect a third line, alternate interior angles are formed. • When two lines intersect a third line, alternate exterior angles are formed. They are placed on the opposite sides of the line where they both intersect but on the outside of every single line. It is not sure that every problem will be given to you with an image. Sometimes you have to make a diagram yourself so that you can visualize the proof. Once you get a rough sketch after making a diagram and by taking into account the given problem, you might have to redraw the diagram in order to gain more clarity and to make sure that the angles are correct. • Ensure that you have labeled everything on the basis of the given information. • If you are able to craft a clear diagram, it will be easier to arrive at the solution. Label all the right angles. Mark the lines that are parallel to each other. Also, ensure that you are able to prove all your assumptions. • On the basis of your diagrams and assumptions, jot down the relationship between different lines and angles. • Write down everything that is already given in the problem as in every geometric problem, there is some data that is already mentioned in the problem. Jotting them down will help you in thinking well in the entire problem. • SSS: side- side- side; triangles are congruent if three sides of one triangle are congruent to three sides of another triangle. • CPCTC: corresponding parts of the congruent triangles are congruent. • SAS: side- angle- side; two triangles are congruent if they have a congruent side angle side. • ASA: angle- side- angle; two triangles are congruent if they have a congruent angle- side- angle. • AAA- angle- angle- angle; triangles with congruent angles are similar but not necessarily congruent. Write down the outline of your proof. For each step, write down the reasons. If required, you can also reorder the steps. Make sure that you complete your proof with a reason in order to justify it. Once you are done with the proof, take a look at it and ensure that there are no gaps in your reasoning. After that, at the bottom right corner, write QED to indicate that it is complete.